The year 2012 was a torrid time for public transport in Singapore: train breakdowns, overcrowded buses and bus driver strikes were all rather new for the commuters of the young, modern city-state. I had a front row seat as the head of a team at the Land Transport Authority of Singapore responsible for public transport service standards. With angry commuters and a system straining at capacity we turned to big data and data science to help us get a pulse on our bus network of 3 million daily commuters, almost 300 bus lines, 40,000 daily bus trips and 5,000 bus stops. We were able to monitor our network in real time and surgically target new buses along a precise bus route, within a 30-minute window and at the bus stop where crowding was most acute. 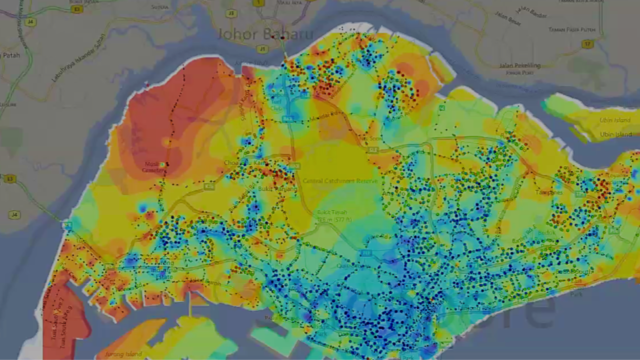 A heatmap of the average journey time to work during the morning peak hours from each of our bus and MRT stops. Data from the Land Transport Authority’s PLANET system that draws journey data from contactless “EZLINK cards”. What struck me over the course of a year going through an iterative cycle of data visualisation, analysis, intervention and surveillance, was just how alive the transport network was. No day was exactly the same, and each week a new surprise lay in wait. There were the regular rhythms – of the first week of January with bleary-eyed office workers returning to from vacation, showing up in turbulent patterns – but also local perturbations. We could almost guess when a new office building or block of flats were launched, disrupting local travel patterns that showed up in our data. This was not a deterministic engineering system built of steel, concrete, cables and tarmac in straight lines and rigid schedules. It was an evolutionary, biological system that ebbed, flowed, reacted and cycled. Yet our approach to public transport was largely a planned exercise of fixed-route lines that were glacial in their ability to change. Some bus routes hadn’t changed in ten years. Sure, taxis and UberPool allow for dynamic routes to form and are part of the sharing economy. But that’s not serious public transportation. Public transport is intended to be an affordable, low congestion, low carbon alternative. We can’t generate the kind of efficiencies possible even if we get two people to share a cab. That’s still an order of magnitude away from the efficiencies of ten, twenty or even forty people on a bus. In a city with impatient highly stressed urbanites, can the public bus experience ever be pleasant enough? Can we enable a system that was truly adaptive and evolutionary, that responds quickly to changing demands and overcomes the coordination problem that becomes exponentially harder when you try to share with more than two people? Such a system would need to be inclusive: it would need to serve commuters with different preferences around price, tolerance for waiting, journey speed, willingness to share and walk to their pick-up locations. The first direction is in adding micro-transit or para-transit to the mix – the space including shared service in groups that is more personalized and direct than mass transit, but cheaper than personal transport options. They forgo the on-demand convenience of Ubers for some degree of advance booking to generate more matches. Finland’s Kutsuplus, the ill-fated Leap, Chariot and Singapore’s Beeline are all various attempts to pursue this approach. But para-transit has a long and veritable history and role in emerging cities: from Hong Kong to Turkey and Lagos. Hong Kong’s ubiquitous and remarkably popular mini-bus system (小巴 xiao ba) is a case in point. With micro-transit, every trip becomes a community, and technology merely helps to build and discover these communities. The second answer is in real-time mobility marketplaces. Some call it mobility-as-a-service, taking reference from the realm of software and technology, but I prefer the economists’ perspective. The market has come a long way: from the bustling medieval bazaars with goods stacked high, to the open call trading pits of the Chicago Mercantile Exchange, to the globalization that e-commerce brought, to stock markets that admit high-frequency, algorithmic trading and ad exchanges where the markets “clear” in the milliseconds that it takes for a website to load and a targeted ad to be selected. A mature transport system demands a real-time marketplace. One that matches the diverse preferences of commuters, able to do so in real-time and to admit and integrate the full range of providers. Today, our mobility market is still fragmented: one has to sequentially choose between Lyft, Uber and public transport; while journey planners like Citymapper don’t allow the full plethora of suppliers to transact. What cities need is a technology platform with a series of core APIs (requests, offers, reservations, payments and location tracking) that provides an open market and a clearinghouse for mobility. In October 2016, President Barack Obama spoke about how governments will never run like tech start-ups because they have to deal with unintended consequences on the poor and vulnerable that nobody else wants to deal with and cannot “just blow things up”. However, in a digital and data driven world, the role of governments will inevitably evolve to keep up with the relentless pace of technological change. Governments must up their technological game so that they don’t impede advancement. But they also have a responsibility to keep public services accessible with markets open and public, that provide options and accessibility for a full range of commuters, not just the privileged and those who live in easiest parts of the city to serve. Governments of the twentieth century would plan cities, maintain public libraries and parks, and establish rule of law to enable fair commerce and trade. In a digital world, planning, governance and rules of commerce will all have to be built into a public technology platform, that will lower the barriers to entry for a never-ending stream of innovators. Technology has so much to offer mobility and it will completely reshape the way we design transportation systems, shifting it from a precisely-planned and structured affair to an organic and evolutionary process, bringing it closer in its nature to the vital, breathing human beings that it serves. Feng-Yuan Liu is the Director of the Data Science Division at the Government Technology Agency of Singapore. One of his teams runs Beeline, a mobility-as-a-service experiment. He is passionate about applying data for the public good and building multi-disciplinary teams in the intersection of technology and the public good. He’s been a public policy wonk most of his working life, with stints in finance, energy and public transportation.